There are plenty of times when, since I write about music frequently, I feel that I’m at an advantage because I’m not familiar with a band’s previous work—or sometimes at a disadvantage. I definitely feel at a disadvantage with Sweden’s heavy metal powerhouse Grand Magus. Sword Songs, the band’s eighth studio album, doesn’t sound a lot like I remembered Grand Magus sounding when I caught a few tracks of theirs. Some of the material I heard had a doom metal style to it or just a classic heavy metal sound, but there was never anything as crunchy and riff mongering as Sword Songs. The production is a big change, as it seems a bit cleared up, but the big difference from everything I remembered of Grand Magus is that this album comes out swinging more heavily than anything I had heard from the band before. “Freja’s Choice” is backed by a bombastic crunching riff. I should point out that none of this is bad at all. From start to finish, there is no boredom, no waiting or skipping to the next track. It’s all killer and catchy as hell. The title Sword Songs is appropriate here. It’s all battle and more victory than any defeat. 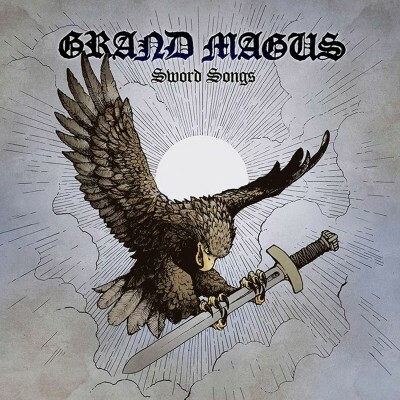 Grand Magus channel listeners’ inner warriors to pump their fists, head-bang and do their best vocal impressions JB Christoffersson’s larger-than-life voice. Not to eat my previous words after the massively punching-riff-oriented first five tracks, the songs “Last One to Fall” and “Frost and Fire” feel like more familiar Grand Magus territory. Their tempos are a bit slower and more epic. The sweeping classic heavy metal songs prior fade into the even more subdued “Hugr,” the album’s chill track. The album ends with “Every Day there is a Battle to Fight,” a lift-your-head-up-high type of track—considering the battle-worthy album, it’s an appropriate end. It reminds listeners to fight through their pain and fight the good fight in the end, to not give up the battle of life. I have to admit, it sounds like a Manowar lyric (silly), but sometimes that can be a good thing, considering that “Manowar silly,” amid their legion of followers, can’t ever be a bad thing.